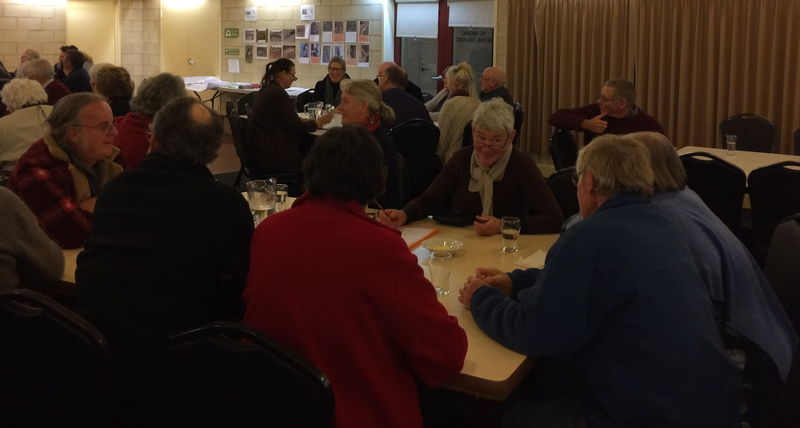 Last Tuesday, 6th June 2017, the Connecting Landscapes Celebration Event saw an engaged community come together to socialise, learn and commit to a future vision of a healthy landscape in the Mount Alexander Region. The celebration acknowledged the achievements of the Connecting Landscapes project over the past five years and recognized Connecting Country’s milestone tenth year. Over sixty landholders who have been part of our on-ground work program were treated to a delicious meal from Growing Abundance and deserts from the Murnong Mummas, trivia competition and an informative talk from David Cameron from Department of Environment Land Water and Planning (DELWP) . Connecting Country President, Brendan Sydes, gives a short history and summary of plans for the future. Brendan Sydes, President of Connecting Country’s Committee of Management, kicked off the evening with an Acknowledgement of Country and a brief overview of Connecting Country history to date. He also launched our new Biodiversity Hub project to be delivered in partnership with DELWP, Trust for Nature, Parks Victoria and Dja Dja Wurrung. Connecting Landscapes project coordinator, Jarrod Coote, gave an overview of the achievements of our Connecting Landscapes project, the staff, and what is next for Connecting Country. Funded through the Australian Government, Connecting Landscapes has been Connecting Country’s major project for the last five years. It has seen huge gains for the environment through our on-ground works, monitoring and community engagement programs. This table speaks volumes about our overachiever tendencies with actual results outstripping our targets in each of the five areas of on-ground works activity. 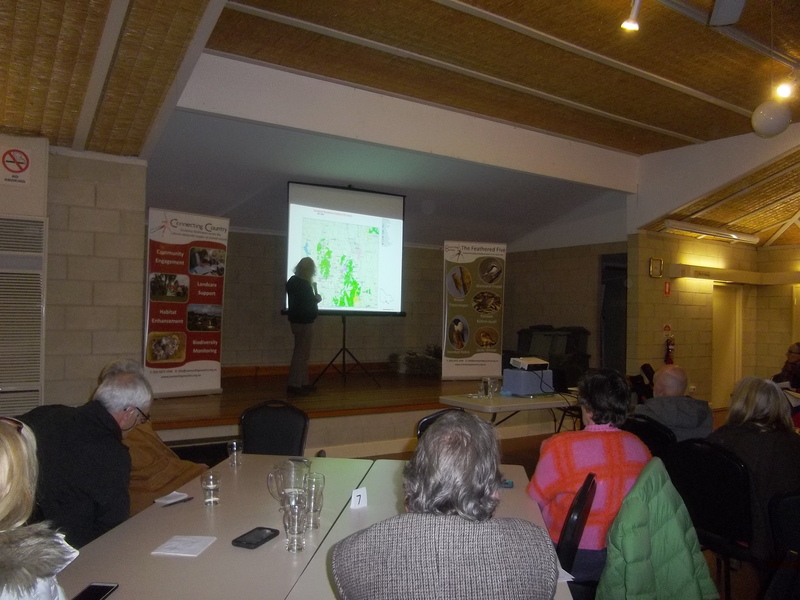 Tanya Loos, Connecting Country Woodland Birds Project Coordinator, gave an overview of the monitoring component of the program. This included highlighting the various types of ecological monitoring undertaken by Connecting Country and acknowledging the many different groups of people involved including volunteers, landholders, experts and students. A highlight was the results for nest box monitoring with increases in occupation of the boxes for Sugar Gliders and Tuans. An overall increase in numbers of Tuans and Sugar Gliders occupying nest boxes across the shire is encouraging. Dinner was served and attendees collaborated on trivia questions which tested their natural resource management knowledge. Well done to the winners of the quiz; with only one question amiss, they secured a nest box each and some plants and guards. Free nest boxes were also given out to lucky door prize ticket holders. All tables put in a great effort on the quiz. The final part of the evening was a talk by David Cameron, Senior Botanist and curator of the state Flora Database with DELWP. His extensive knowledge about plants and, in particular, important weed species of the future was welcomed by the audience as useful advice for what to focus on their properties. David Cameron talked about plant identification and weeds to look out for in the future given the likely effects of Climate Change. Desert was served with many happy faces exchanging conversation in the cool of a June night. We would like to acknowledge the funding from the Australian Government which made this evening and the Connecting Landscapes project possible. We would also like to warmly thank all of our landholders and groups who have been involved in Connecting Country projects so far – every little bit of change we create helps biodiversity across our landscape. We look forward to more exciting projects like this in the future. I was so disappointed to have to miss the night. I was at a training session in Melbourne. I would like to sincerely thank all of the CC staff for their patience, passion, knowledge, skills and help. yours is one of the most successful organisations I have ever come across in my 40 years of community action. Well done and I hope to be a participant in any future programs.